Info "Connect the dots! But be careful not to break your pencil lead." Connect the Dots is one of Orbulon's microgames in WarioWare: Twisted! 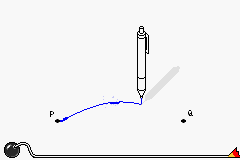 The game's purpose is to connect the two dots with a line drawn by a mechanical pencil. 1st level difficulty: The pencil lead is solid. 2nd level difficulty: The pencil lead is fragile. 3rd level difficulty: The pencil lead is fragile, and there are staples to move out of the way before connecting the dots. This page was last edited on September 26, 2018, at 20:43.